There’s nothing like the sights and sounds of spring to get you feeling excited about gardening. For one thing, there are the flowers poking through the ground and opening to reveal yellow, purple, pink, and white blossoms. Then there are also the tree buds cracking open to spread a mist of green in the trees. 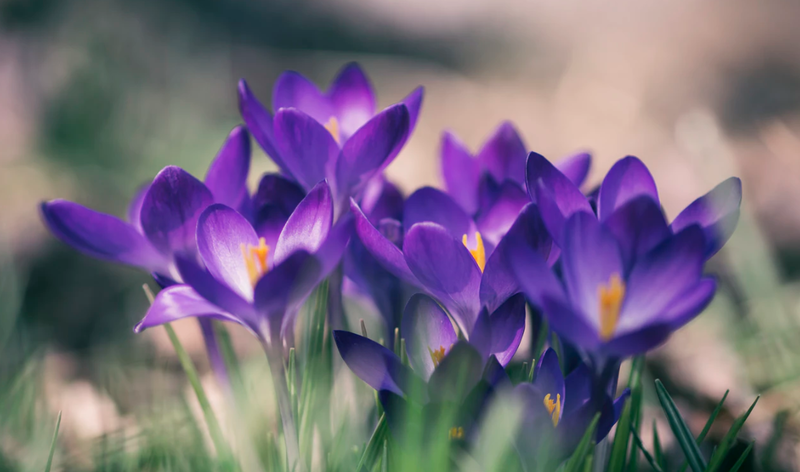 From the crocuses, daffodils, and forsythia to the cherry, pear, and oak trees, a beautiful freshness is springing out of the drab winter outdoors. And maybe it’s stirring the gardener within you. Of course, one factor you may encounter living in your mobile home is a lack of space to do all the gardening you might like. If you have a small home and a small plot of land, you may feel that it cramps your gardening style. But, the good news is, you don’t have to give up on cultivating beautiful growing things because of your reduced space. In fact, with a healthy dose of creative thinking, you can probably exercise that green thumb right where you are. Now, once you decide to make the most of your space and garden in a way that works where you are, another consideration is what kind of garden? Just think about the tremendous variety of plants in the world. Which ones will you want to grow? Perhaps you’ll find that some work better for your climate and your space than others. You could opt for gardening mostly with flowers—pots radiating lovely colors. Or perhaps you prefer succulents. Maybe your style is to stick to green shrubbery and small trees. On the other hand, perhaps you’re thinking of augmenting the plants with non-living items by putting in a rock garden. Plus, there’s always the idea of growing a garden so you can consume it—in which case you may gravitate towards a vegetable or herb garden. With your gardening future pulled in so many directions, let’s take some time to dig into small garden ideas grouped by some of the options we just listed. Whether you create a line of hanging flower pots across a front porch or hang them above your small back deck to create a living awning, remember that flowers don’t have to be planted in the ground. And use “pots” that reflect your style, from vintage finds to brand new options. What do you do when all you have is one corner and your natural love of flowers? You create a 3-Tiered Stacked Planter with these instructions from Birds & Blooms, of course. Sometimes, when you put something “on the wall,” you’re talking about hanging up decor like a tapestry or a painting. But, you can actually put plants on your wall, too. From strategically planting in a pallet stood upright to anchoring small flowerpots to your wall, don’t be afraid to put your outdoor vertical space to use when space is limited. Even if most of the space you have on your porch is already spoken for, don’t worry. All is not lost. If you still have your railings, then you still have a spot! Whether you choose a traditional railing planter or opt for something more creative, like adapting this DIY from home stories: A to Z for your railing. Maybe you’ve been following as these cute plants have grown in popularity. Are you succulents’ number one fan? Then, maybe it’s time to create a succulent garden in the small space around your mobile home. If you only have one open spot on your back porch or patio, tote in a round metal washtub or a short barrel to provide a home for your succulents. Create a “one pot” garden by adding soil and several different succulents. Another idea is to create a striking array of small succulents each in their own small container. Get creative with the pots here. Perhaps it could be actual miniature pots in colors that meld with your other decor. Or maybe you’d like to use small teacups for a vintage effect. Short canning jars could also be an option. You may be able to use other design elements of your mobile home as inspiration. For instance, you could match the pots to the colors of your shutters. Or you could plant in containers that complement your deck furniture. And if you need more ideas, check out Small Pots for Succulents from JOY US Garden. While porches and tiny backyards are potential options for small scale gardening, what do you do when there’s no outside space available? Well, you simply garden inside! 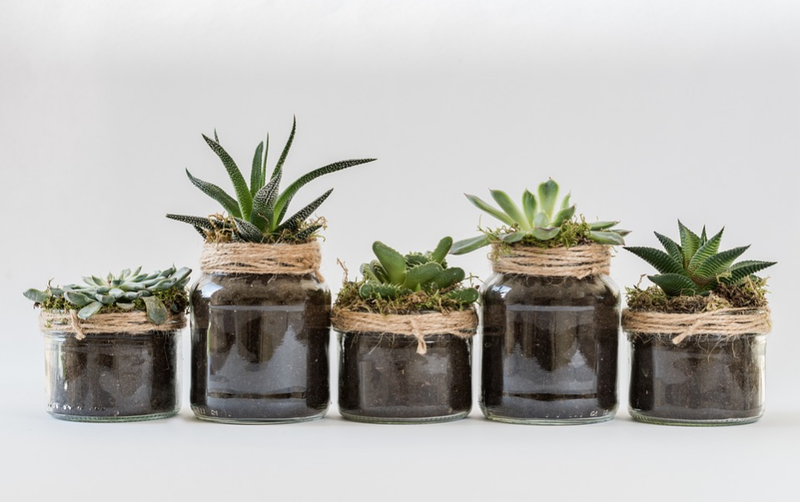 Besides the health benefits of growing plants in the house, there’s also the obvious visual advantage—growing plants can make your house look lovely. Let’s look at some ideas to get you started. Here’s a way to cheer up your kitchen — grow a garden in it. Imagine how striking a row of colorful gerbera daisies could look sprouting from pots lined up on your windowsill. Or, visualize the beautiful effect that one or several small green plants could have sitting in the same location. And if your kitchen already has it’s own color scheme, why not try to match it with the plants you introduce? There’s also the option of limiting your indoor gardening to a single area of the house, turning one room into a forest or jungle. For instance, think about creating a relaxing sunroom full of plant growth. Whether you choose green plants only or introduce colors too, study up on what plants will thrive indoors. Obviously, walls are important because they help hold up your house. But if you think preserving your mobile home’s structure is all that walls are good for, you’re in for a great surprise. Tap into your walls gardening potential by using or making wall-friendly planters. Add a touch of class with these striking planters. Or for a look that’s a bit more rustic, how about these planters that can be personalized. Need a wall solution that incorporates the warmth of wood? Then, New Project Designs has you covered. While you can consolidate your gardening efforts in one room, windowsill, or wall, you could also spread the plants among different rooms. Perhaps you could start with a few pots of small plants on the kitchen window as we suggested above. Then, you could add a few indoor trees to your living room landscape. And don’t forget the bedrooms—how about placing plants on a bedside table or desk? Clearly, using plants inside as decor can make for a lovely space. However, maybe it’s time to take your indoor gardening to the next level, by crafting something that’s not just beautiful but also edible. Enter herb gardening. For those of you who love to cook with fresh ingredients, this sounds like a dream come true, doesn’t it? Here’s a new twist on the “farm to table” idea. Why wait for a farm to grow your herbs when you can cultivate some of your own much closer to home? As we mentioned above, line pots on your windowsill but, this time, fill them with food (or soon-to-be food). Check out Savvy Gardening’s The 7 best herbs for container gardening. And it doesn’t have to be a small windowsill, if you have a bay window, you may be able to up the number of plants you can fit. Looking for a portable herb garden that could migrate around your house? Then you need to check out this Mason Jar DIY Herb Garden from Crafts Unleashed. The glass that lets you see through to the soil is great. Plus, planting in four identical Mason jars could lend some uniformity even when you’re planting different herbs in them. And that black holder pulls it all together, literally and figuratively. When you’re not a fan of flowers, and you’d prefer to work with just one color, perhaps the solution is simple: green plants. 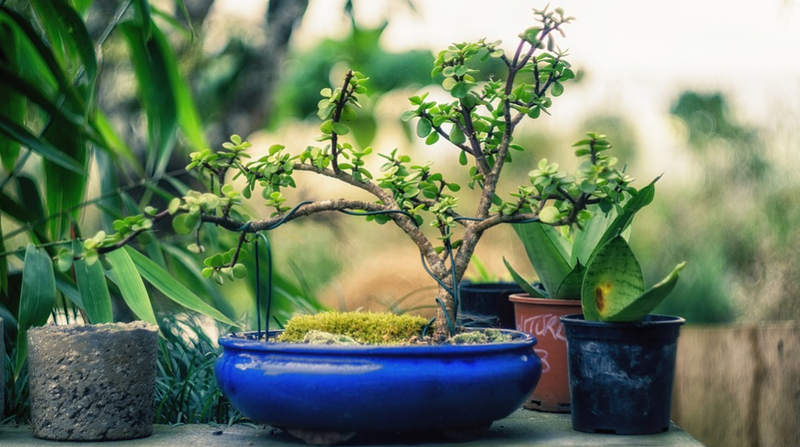 From ferns to ornamental shrubs to small trees, green may limit you to one color family, but it certainly doesn’t limit you to one kind of plant. Take some inspiration from these green (or mostly green) landscapes. Sound simplistic? Perhaps. But if you’re irresistibly drawn to the color green, just the most beautiful garden porch you’ve ever seen. Could you recreate the look, but with green growth as the star? Envision every colored plant replaced with a green plant of your choosing. Surprisingly, this actually doesn’t require breaking ground behind your mobile home. So, if you were already imagining a sore back, you don’t have anything to worry about. Actually, it’s a creative wall planter that just might snag you. Get your green plants growing in this. Not only can you plant green things at the base of your fence, but you can also add green plants on your fence. 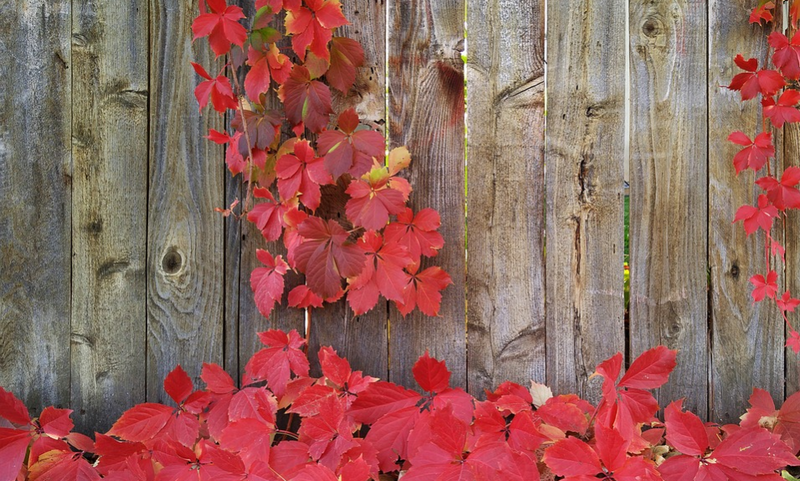 For that matter, you can add other colored plants on your fence, too—just use a fence planter. There are plenty of fence planter options for helping you spread your green oasis further than the lawn or porch. Just choose one that blends well with your home and landscaping. Now for a simple idea that could provide plant life without taking up too much space. If you have wide enough stairs, place a potted green plant at the end of each step. Depending on your steps, you may even have room for a plant at both ends of the step. And choose your planters wisely—matching ones could look great. But different colors could be another way to go as long as you keep the overall effect from looking messy and discombobulated. Need yet more ideas to help you exercise your green thumb? And you thought succulents were popular! Turns out orchids are one group of plants with quite a dedicated following. Looks like orchid enthusiasm isn’t new, either. Is it time for you to dive into orchid growing yourself? If you find yourself bitten by the orchid bug, then head to Gardening Know How’s Beginner Orchid Growing: Getting Started With Orchid Plants. Greenhouse gardening is not off the table just because space is limited. In fact, greenhouse gardening could be on the table (literally) with a tabletop greenhouse. But, some of you may be looking to grow a little more than what you could fit in a mini greenhouse. If so, there are still options for you in between the miniature and full-size versions. For instance, consider this greenhouse that wouldn’t take up too much space. Another way to squeeze in some living plants is to cultivate climbers. For one thing, you could try growing a climbing plant on an existing structure—like your fence, porch railing, or pillars. But, you could also introduce a trellis into your space. Or, you could give your porch a climber-friendly open roof structure. Then, head to The Spruce’s Top 6 Choices for Vines and Climbing Plants to learn more about your options. Once you get your hands in the dirt (whether the ground or a bag of potting soil), you may discover anew just how much you love gardening. Or if it’s your first time dabbling in the art, you may have found yourself a new hobby. And if you want to keep the gardening thoughts coming, head to our 10 Types of Gardens That Will Update Your Mobile Home Exterior.